There is a difference in tee shirt quality. Many manufacturers have introduced premium tee shirts which are a little finer, a little heavier and sized to fit. These are the styles that Northwest Custom Apparel offers its customers. The norm is now customers are asking for a better grade of tee. A premium T-shirt is knitted using ring-spun rather than open end yarns. In ring spun goods the fibers are all aligned in the same direction. Open end spinning produces the cotton fibers run in random directions. Manufacturing regular cotton is less expensive than ring spun and does offer breathability the softness is just not there. 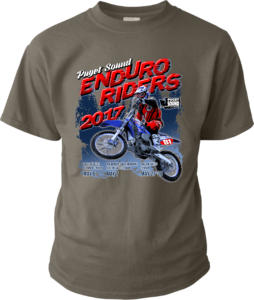 However they are great for promotions like a race, a company picnic, fund raiser or when price is the determining factor in purchasing. Ring spun definitely gives you a much nicer yarn says Jim Mickelson CEO of Northwest Custom Apparel. Being ring-spun makes it stronger and makes the fiber more uniform. This is where you get the softer hand which takes the stiffness out of a finished tee. The other fundamental distinctions between a premium and a mid-range Tee consists of the amount of fabric. We see more and more oversized tees being asked for along with a heavier tee and a larger size. There is also a belief that taped seams make for a better shirt. All this does is add to the cost. The stitches used in making the shirt are so good that taping is not necessary and just adds to the cost. Double stitching on the sleeves and at the waist adds to the strength of the garment. As with any purchase, you must determine what’s most important to you, what you’ll be using your shirts for, and how much you want to spend. Though ring spun cotton is generally a bit more expensive, the added cost is minimal and will not break the bank. As the old adage goes, buy nice or buy twice.